I’m back with some more delicious bruschetta today! Yay! If you weren’t yet aware of my love for bruschetta, you should probably check out my Bruschetta Pasta, and Pantry Bruschetta recipes. They will leave you drooling, just like this recipe is about to. Bwah ha ha. What I love about this classic appetizer is that I turned it into a dressing recipe, using Kraft Zesty Italian instead of traditional olive oil to make a stunningly vibrant caprese bruschetta. The simplicity of this caprese bruschetta makes it a family favorite, as well as a party favorite, since it only takes about 20 minutes to whip up a bulk batch ready for devouring. Definitely do not skip out on the balsamic reduction, which is very simple to make and you can grab the instructions for that here. When it comes to slicing the mozzarella, make sure you are using a very sharp knife, otherwise the mozzarella will smash. You could purchase pre-sliced mozzarella, which I’ve been known to do from time-to-time, ha ha ha. Consider that a time-saving tip. Did you know that Kraft Pourables have been reinvented with a new, better taste? Kraft’s Zesty Italian has even more herbs and spices, making it perfect for this recipe with it’s bold flavors to compliment the mild flavor of the fresh mozzarella. You just can’t go wrong with this caprese bruschetta recipe, and I hope you give it a try sometime soon! 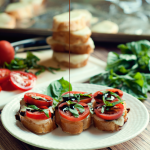 Ready to make some delicious caprese bruschetta? Check out the recipe below! Preheat the oven to 375 degrees and line a baking sheet with aluminum foil. Slice the baguette into 24, 3/4 inch slices. Dip each slice into a shallow dish with the dressing, coating one side, then place on the baking sheet, dressing side up. Slice the mozzarella into 24 strips and lay one strip on each slice of bread. Bake for 15 minutes, or until melted and bubbly. While the bread is baking, slice the tomatoes and dice the basil. When the bread is out of the oven, layer each piece with a couple slices of tomato, a pinch of diced basil and a sprinkle of kosher salt. Drizzle with the balsamic reduction and enjoy! Grab Kraft Pourables in the condiments and dressings aisle at your local Walmart! I am drooling over here. Can't wait to try this - it looks so good. This looks seriously heavenly. I want this so bad now!! I wish we were neighbors so you could cook for me all the time hahaha. Dang, girl! You have some mad food skills! Love this! Oh man thank goodness it's lunch time or this would have been running out to pick up food! This looks amazing and I will have to try this! I don't know how you do it but you manage to make tomatoes look delish and I don't even like them! So much yum! This is already on my menu for the weekend!! I have NEVER had bruschetta and I'm not a fan of tomatoes, but WOW, after seeing these pictures... I definitely want to make this!! Yummy! This looks absolutely delicious Karly! Yummy in my tummy. I'm not a tomato fan but these look amazingly delicious! Adding to my list of must makes! Looks and sounds delicious! this looks delicious. i need them in my life! Oh. My. Word. Get in mah belly!! Looks amazing! Oh wow that looks so good! I love Bruschetta and am so going to try this recipe! This looks fantastic!Thank you for stopping by the Thoughtful Spot Weekly Blog Hop this week. We hope to see you drop by our neck of the woods next week! Gorgeous photos, and it looks AMAZING! I don't like tomatoes and I would still be alllll over this.Thanks for linking up at Wordy Wednesday! Sounds wonderful, and making me hungry right now! I have never made bruschetta at home, but you sure make it sound easy!